We would like to thank Ken Wysocky for his great write up about us in Cleaner Magazine’s December issue. You can read the full article below or check out the e-zine here. Bob Oates can divide his four decades in drain cleaning into two distinct chapters. One covers his days as a competent but somewhat narrow-minded contractor with an outdated business model. The second chronicles his emergence as a businessman with clearly defined goals for boosting revenue and better serving customers. How Oates, the owner of Bob Oates Sewer Rooter in Seattle, moved from one chapter to the next underscores the difference between owning a business and just owning a job. It also drives home the importance of offering customers a diverse set of services and long-term solutions to drainline problems, which subsequently requires investing in top-notch equipment and advanced technologies. Furthermore, Oates’ story also shows the value of hiring people who know more about specific areas of business and, of course, learning from mistakes — and Oates candidly admits he’s made his share. Oates is a second-generation, old-school sewer cleaner whose father founded Dial A Sewerman in Queens, New York. His odyssey began when he started working for his father at around age 12. When he turned 16, Oates dropped out of high school to work full time with his father. By 1989, Oates was running three trucks. But he was also growing weary of New York, so he did some research and decided to move to Seattle. The decision was partially spurred by the region’s rainy climate, which he felt would ensure steady drain cleaning work. Oates first worked at another company for about six months to get the lay of the land before launching Super Rooter on his own. To build a customer base, the resourceful Oates developed a mass mailing list by going to a public library and hand copying the names of city property owners listed on the city’s tax assessor records. “I targeted people with more than one property so I could get more bang for each stamp,” he says. He mailed more than 5,000 marketing letters during his first month in business; he personally signed each letter and hand addressed the envelopes. The self-developed marketing campaign generated about a 1.5 percent response rate, a decent return for direct mail. Here’s where things got interesting. A local plumber who loved the name Alligator Sewer and wanted to establish a foothold in the local drain cleaning market started courting Oates. Eventually, he convinced Oates to sell Alligator Sewer to him, then stay on board under a four-year contract to develop a drain cleaning division. It proved to be a life-changing event. Oates had an even bigger epiphany when he saw the value of offering long-term solutions to customers with drainline problems, as opposed to unclogging drains for a couple hundred dollars, then quickly moving on to the next job — “hitting and running,” as he calls it. The long-term solutions were not only exponentially more profitable, they also led to greater customer satisfaction. “I was used to cleaning lines and then thinking, ‘See you next year,’” he recalls. “But I wasn’t providing good service by hitting and running. This job taught me to take my time, put a camera down a line to see if it required more cleaning and offer long-term solutions. In June 2006, Oates’ four-year contract expired and he opted to be his own boss again. His contract did not contain a no-compete clause, so Oates set off on his own once again, equipped with a brand-new Chevrolet cargo van, a Spartan Tool drain cleaning machine and a portable jetter built by JETTERS NORTHWEST. But this time, he was a man with a plan. For example, he hired a professional estimator because he realized he wasn’t good at bidding on jobs and also hired a general manager. The estimator sold so much work in the first six months that Oates was forced to hire eight employees. Now the company employs three full-time estimators as well as five two-man excavation crews that Oates says are busy every day. Another critical factor in the company’s growth was Oates’ insistence on investing in the best equipment possible. Good equipment increases productivity and is less prone to profit-killing breakdowns and, as such, contributes to good customer service. But reliable equipment also makes for happier employees, which can help minimize turnover. Today, about 50 percent of the company’s revenue comes from sewer repairs, roughly 25 percent from sewer and drain cleaning, and another 25 percent from plumbing services, which the company added in response to customer requests. To provide all those services, the company relies on a Harben trailer-mounted water jetter (16 gpm/4,000 psi) with a 300-gallon water tank; a trailer-mounted jetter (18 gpm/4,000 psi) made by JETTERS NORTHWEST with a 300-gallon water tank; and a truck-mounted jetter (12 gpm/3,000 psi), also made by JETTERS NORTHWEST with a 100-gallon water tank. For the company’s four plumbers and five drain cleaning service technicians, the company runs five Chevrolet box trucks with bodies made by Heiser Body Co., three Chevrolet 3500 vans and one Dodge ProMaster van. Nearly every truck carries a portable wheeled jetter (5 gpm/4,000 psi) built by JETTERS NORTHWEST, a RIDGID SeeSnake pipeline inspection camera and a RIDGID SeekTech SR-20 pipeline locator. The company also owns a SeeSnake Mini camera, a SeeSnake microReel camera and seven NaviTrack Scout pipeline locators, all built by RIDGID. In addition, the business also owns about 10 Spartan 1065 drum drain cleaning machines, three Spartan 300 drain machines and 12 Spartan 700 hand-held snakes for sinks and tub drains. The wide range of equipment enables the company to fulfill a critical part of Oates’ business plan: offer customers as many solutions to drainline problems as possible and become a well-diversified company that doesn’t have to give work — and revenue — away to subcontractors. Pipe bursting and pipe lining are good examples of services that complemented drain cleaning. Because entering these markets required a considerable investment, Oates waited a couple years until he was established enough to obtain financing. Then he began investing in pipe bursting systems made by Spartan, TRIC Tools and Pipe Genie Manufacturing, along with a Nu Flow pipe lining system. Looking back, Oates marvels at how much his business philosophy has changed over the past few decades. “When I started out, all I did was clean drains,” he says. “Now I manage people and money. It’s the hardest thing I’ve ever done because now I’m responsible for all my employees. What advice would Oates offer to other one-man outfits with dreams of growing bigger? Without hesitation, he offers his three-pronged plan for success: Hire the best employees. Buy the best equipment. And offer customers permanent, long-term solutions to their drain problems. 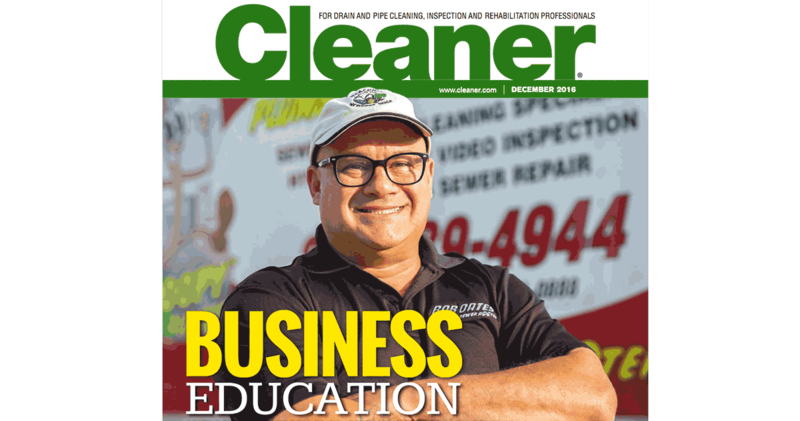 As Bob Oates explains his drain cleaning and plumbing firm’s integrated marketing campaign, it’s hard to determine what’s more impressive: the number of different platforms and venues he uses or the fact that the high-school dropout is a self-taught marketer. But one thing is certain: In an age where brand identity is critical, Bob Oates Sewer Rooter in Seattle stands out in the crowd. A popular mascot called Poopy the Plunger. Sparkling clean, bright-red service trucks instead of more common white vehicles. A social media presence on platforms such as Facebook, Twitter and Instagram. Billboards and municipal bus signage. Uniformed employees. No matter what the medium, Oates uses marketing as the ultimate competitive differentiator. The internet and social media efforts generate a significant amount of annual revenue. To make sure he gets it right, Oates followed one of his tenets for success and hired someone smarter than him, in this case, Tashia Ortiz, a social media expert. “She’s rockin’ it for us,” Oates says.